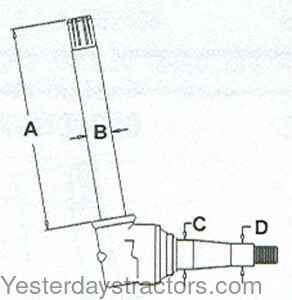 Description: Spindle, LH/RH. Dimensions A-27.375 inch, B-1.50 inch, C-1.687 inch, D-1.312 inch. For 2510, 3020, 4000, 4010, 4020, All Hi-Crop, 2520 Hi-Crop Serial Number 21001 and up. The wheel bearing kit used on this spindle is kit part number WBKJD6.